Great testimonials mean quality products with enthusiastic service! Exactly what you will can expect at K. John Mason Ironworks! You are lucky that he can ship these one of a kind works of art to your door My home is alive with the timeless pieces Mr. Mason has created and they will stay in my family long after I'm gone. An investment in beauty lasts forever. The fact it's hand-forged wrought iron just guarantees it will. They are drop dead gorgeous!!! You never disappoint, John. They are even more beautiful than the ones in the picture! The design of the freezer hardware is phenomenal - I absolutely love it!!! You certainly made my day!! I am your biggest fan, and can see that you are a true artist! Please accept my thanks! It was an absolute pleasure, as usual, doing business with you! Racing all over the world, the temperatures inside the race car get over 60 degrees centigrade....the Lariat Stand airs out my helmet faster and easier than ever. At home, the Shield Mount is the absolute way to keep my helmets in safe condition whilst displaying them attractively. I couldn't be happier - absolutely awesome. Thank you for the unique garden hose holders. 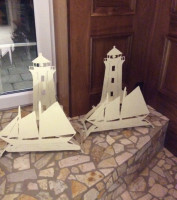 Peggy's Cove lighthouse and the Bluenose look beautiful, can't wait to use them next spring. 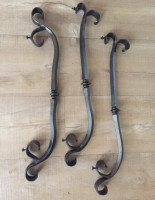 For anyone who values handcrafted one of a kind ironwork I would highly recommend K. John Mason's Ironworks. I purchased my first motorcycle two years ago. 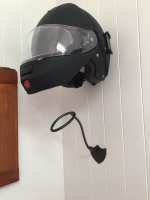 My training ingrained in me to never drop my helmet....this led me to search for a wall bracket suitable to hang my helmet. As I searched motorcycle shops I was astounded that not one of them carried such a device. The two brackets you made for me are totally functional, look good, and were easy to install. Keep up the good work! Carrying on a family tradition, I have known John as a precision Artisan Craftsman in one of the oldest professions: the Blacksmith. Having had formal hands-on training, he has taken the Blacksmithing Craft from the necessary to the extraordinary! His prized works of art and creations are seen around the world, there is nothing that this man can't take from a conceptual pen drawing to reality. After purchasing some counter stools from Malaysia, I realized the foot rests were far too high.... After viewing the stools, John was confident he could resolve my problem. John designed his own wrought iron foot rest that extended and easily attached to the existing foot rest; not only does the new foot rest look nice, it is comfortably functional. I am very pleased with the final product! 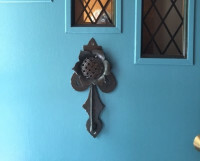 The sunflower door knocker on my front door is a wonderful example of John's creativity and artistry - it makes me smile every day and everyone who visits comments on how beautiful it is. Jayne and John - it was the surprise I had hoped for. My daughter Julia was delighted with the lantern and completely surprised. Many thanks for the excellent repair/restoration job you did to put it back to its original charm. I bought a metal frame mirror from K. John Mason's Ironworks. The mirror was a custom piece. Jayne was helpful with information and very responsible to my multiple inquiries. The mirror was made in less than one week and arrived at my home well packaged and in perfect shape. Overall I am very pleased with my purchase and will not hesitate in the future to buy additional items from K. John Mason's Ironworks. From the moment we met John and Jayne we knew they were going to be able to help us with our dilemma, what to do with an old iron pot. Between John's creative mind and expertise with iron working and Jayne's excellent communication skills, we felt comfortable and involved in the whole process as John transformed our old family cauldron into a beautiful, unique outdoor table where our family will gather to share meals. While visiting the Wolfville farmers market last fall, we saw Mr. Mason's beautiful sunflowers. I sent an email about doing a custom piece for a present for my girlfriend, a multi headed sunflower, and to add a bee. I can tell you we were blown away by the results. You are a true craftsman and artist and we will enjoy this in our garden for years to come. We are so impressed with the workmanship and business acumen which you obviously bring to the situation. I have given your name to quite a few people. 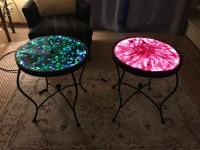 Almost 20 years ago I made these 2 fused glass slabs and I have waited and wondered how to display them. And now thanks to John Mason’s creative genius and skills as a master iron worker I have these beautiful and elegant tables. He designed them to accommodate the new LED lighting technology and created a perfect blend of two art forms. We wanted a unique railing to accent the stairs my husband built. The vision of wrought iron with an emphasis of nature incorporated was what we imagined. John created a sculpture of art that went above and beyond our expectations, workmanship that has astonished both family and friends. We are totally amazed at what John and Jayne created and looking forward to adding another piece of John’s work to our home.